The G-17 Staggerwing is the final civilian variant of the Model 17 Staggerwing series of biplanes by Beechcraft. Designed as a quick, roomy transport for business executives, the Staggerwing’s most distinctive feature is its negative staggered wing configuration, wherein the lower wing is mounted slightly ahead of the front. This unconventional configuration gave the pilot visibility and at the same time reduced the interference on its fabric-covered wings. The staggered wings, coupled with its then-revolutionary conventional landing gear, smooth lines, and powerful Pratt & Whitney 9-cylinder engines, made it the VIP transport of choice across America. A total of 20 G-17 Staggerwings were produced from 1946s to 1948, with several models still existing to this day. The Beechcraft Staggerwing is one of the unique stories in the history of civil aviation, and you can appreciate this eccentric yet highly successful aircraft design with the G-17 Staggerwing 1/32 scale model aircraft. 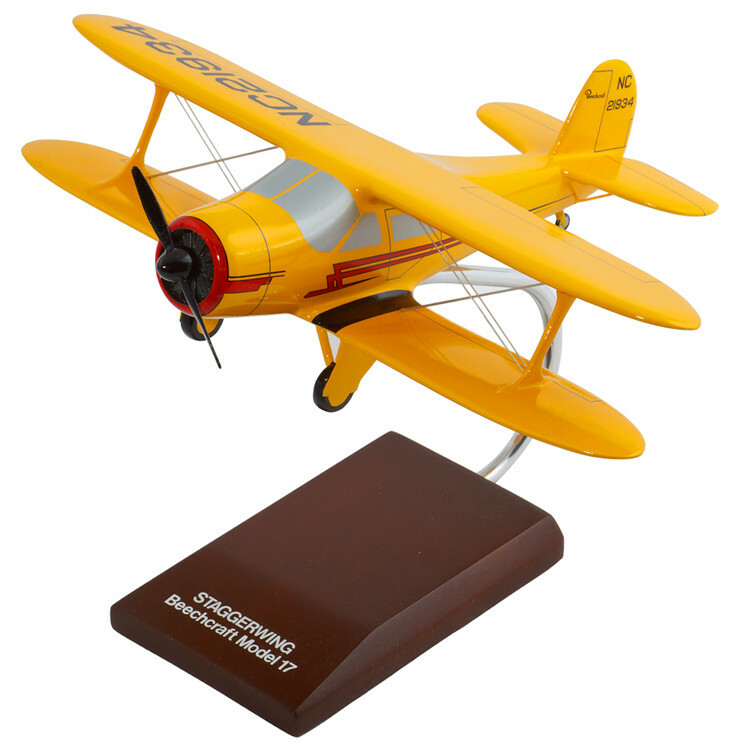 Made from meticulously chosen wood and other materials, these models are guaranteed to be a near-accurate scale aircraft replica of the actual G-17 Staggerwing. From carving and sanding to painting and detailing, everything is done by hand to ensure only the best quality. So if you are searching for a good conversation-starter in your office or living space, you should certainly get this model today.